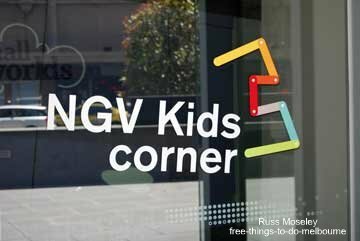 The Ian Potter Centre KIDS CORNER (which is part of the NGV (National Gallery of Victoria) is currently closed but kids activities are still available at the NGV International about 200 metres from here. See NGV Kids. ........There's plenty of childrens activities to keep them occupied for an hour or so. 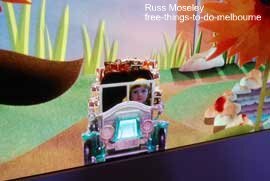 The exhibitions change periodically so you can keep returning without your kids getting bored. ........music and a few other bits and pieces. 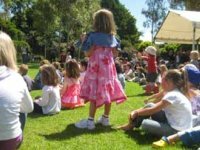 .......In the main part of the Ian Potter Centre you'll also find free regularly changing events for kids of all ages and free films. Check out their website before you go along to see what current events are on. It's at NGV. The Ian Potter Centre Kids Corner is located on the ground floor at the farthest corner of Federation Square from Flinders Street railway station, fronting Flinders Street. It's open 10am-5pm daily except Mondays. Click on the blue writing beneath the map for a better look where Federation Square is located.